Welcome to The Old Chauffeurs Cottage in Howkeld. Situated between Helmsley & Pickering, just off the A170. 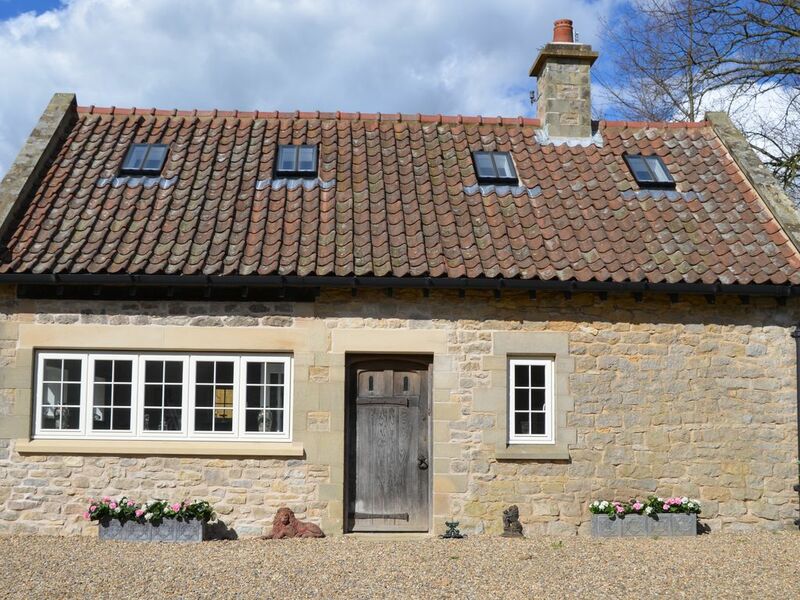 This delightful early 1900's stone built property which has been newly refurbished to offer superb accommodation for adults visiting the North Yorkshire Moors National Park. This cosy cottage provides an excellent base for walkers, An Adults only Holiday Cottage. Inside the light and spacious lounge has attractive floor to ceiling windows overlooking the garden and countryside, two large Italian leather sofas, a round glass coffee table, a flat screen TV and a DVD player. The lounge is 24msq. The attractive dining kitchen has everything you may need for a relaxing and enjoyable break such as a dishwasher, Miele washing machine, tumble dryer, ceramic hob, fan oven and a good size dining table. It is 20msq. The two first floor double bedrooms each have very comfortable king sized beds which share the use of a luxury bathroom with hand basin, full size bath, WC and separate shower. The ground floor has an additional cloakroom. There is a lovely outdoor seating area at the cottage where guests can relax and enjoy the wonderful country views. There is plenty of off road parking, and secure storage for bikes. The rental price includes bed linen, towels, gas central heating and a welcome pack. We accept short breaks of two nights. The cottage caters for adults only. Main bathroom is upstairs with a full size bath and large separate shower. Vanity unit and WC. Downstairs WC and wash hand basin. A secure garage, to store your equipment or tack. Everything we needed to make a lovely stay. High spec accommodation where you can take your pooch! Beautiful cottage furnished to a high spec. The owner had thought of everything and everything was of top class quality. We spent a long weekend here and enjoyed long walks, tranquility and the charm of local towns. Ideally located to explore the North York’s moors, indulge in good food and get some fresh air. The cottage is cleverly designed and offered plenty of room for the four of us. Warm, comfortable and well equipped. Brilliantly located to visit North Yorkshire and York - providing a great base to return to in the evenings. Great property and most welcoming but not over bearing hosts. Thoroughly recommend. Loved this charming cottage - nice, clean and modern. Beds were amazingly comfortable, kitchen was modern and up to date - views were fantastic! You are welcome to stay anytime and thank you for leaving our lovely cottage clean and tidy. This cottage is in a nice quiet location but close to the main road and easy access to Helmsley, Pickering, Malton and the moors too. It's finished to a high standard with comfy sofas and very comfy beds, it's spacious too. However there are some things we found that were rather odd. The kitchen had a garlic press but no grater or egg cups. Also there were no blinds or curtains the kitchen/diner so it felt like you were in a goldfish bowl. Upstairs in the bedrooms, one had a set of drawers but no hanging space, the other had hanging space but no set of drawers. Neither bedroom had any blind or anything to stop the light coming in from the velux window. Even in October, that was a pain, I can't imagine what it would be like getting the sun coming directly in at 3am in June? Given the general high standards of finish and the nice toiletries, we were a little surprised to have such small bath towels too. Overall it was nice, just a bit odd to have all these fairly basic omissions. It is bit odd that you didn’t just pop over and ask us for grater or egg cups, we are only across the court yard or you could have emailed if you didn’t want to speak to us. I never thought that people needed egg cups these days but I have now put two egg cups in the Cottage. I don’t know where the cheese grater went but I have replaced it. We have now put some quality vertical blinds in the kitchen, I am sorry you felt you were in a gold fish bowl, no-one could see in the kitchen apart from my husband and I and we would have to walked over to look in. Please lets us know if you want to bring your PETS they are charged at £20/pet per stay. Discounts may be available for stays of four nights or more.